MUSEUMS THROUGHOUT THE WORLD pay tribute to our ancestors through grandiose oil paintings and intricate family trees replete with branches. Barring a handful of exceptions, every member of our global society can trace their genealogy back at least one generation, and often times many more. Given the traveling concept of THINK Global School, the opportunity for a special moment to arise is ever-present. 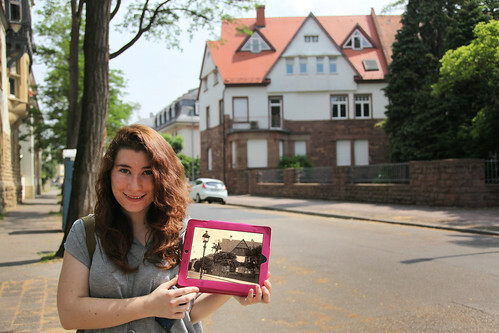 This held true during our recently completed term in Berlin, when 10th grader Bailey D. fulfilled her desire of visiting what was once her family’s home in Karlsruhe, Germany. A flourishing Jewish community before World War II, Karlsruhe saw the population obliterated by the Nazis in 1938, with many of the local men arrested and sent to the Dachau Concentration Camp. Now a resident of New Zealand, Bailey’s grandfather has shared with Bailey many of the atrocities committed by the fascist regime during the war. Along with Media Specialist Lindsay Clark, Bailey traveled to Karlsruhe with the intent of filling in the blanks of her lineage. Equipped with a video camera, the pair documented their travels and conversations with local historians, all of who were happy to contribute their knowledge to her experience. The trip culminated with a visit to the resting place of Bailey’s great aunt and uncle — both of who were murdered at a concentration camp. Here, Bailey planted a seedling she had received at the Berlin Biennale from the grounds of Auschwitz. With this symbolic gesture, she finally had the opportunity to “put family ghosts to rest”.